Lichen grows on a snow-covered rock. Photo courtesy of Ctd 2005 via Flickr. This nonfiction article is written for use with upper-elementary students (grades 4-5). Modified versions are available for students in grades K-1 and grades 2-3, or any student needing a simplified version. As always, consider the reading level and needs of your students when selecting a version for classroom use. At each grade level, the article is available in three forms. Printable pdf files allow you to print this story in either text or a foldable book format. A partnership with Content Clips has allowed us to create electronic versions of the articles. Your students can read along as they listen to the text – a wonderful way to support struggling readers! Related activities provide tips for integrating this story with your science and literacy instruction. Interested in other nonfiction articles for your students? Browse all twenty sets from the Beyond Penguins and Polar Bears collection on our Stories for Students page! Imagine sharing your body with another person. Perhaps you’d each have a job. Your job might be to move and talk. The other person’s job might be to eat and drink. It sounds crazy, but there are organisms on Earth that live this kind of life. They are called lichens. Lichens are living things that contain two separate organisms. Lichens are made of both a fungus and an alga. This strange combination is very successful. 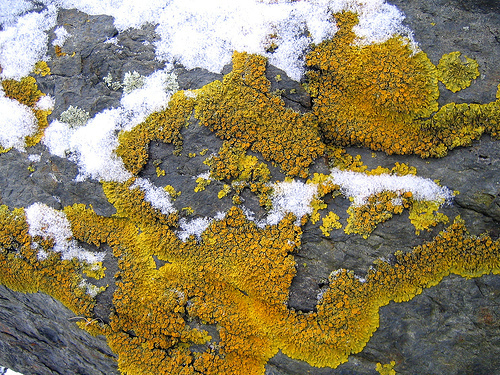 In fact, lichens are among the few organisms that thrive in the cold regions of both the Arctic and the Antarctic. Fungi (the plural of fungus) include mushrooms and toadstools. You might think of these as plants. In fact they are much more like animals than plants. Like animals, fungi must eat. And like animals, fungi can’t make their own food, but must find it somewhere else. That’s where the algae come in. Algae (the plural of alga) are very simple relatives of plants. But “simple” is misleading. Green plants and algae perform perhaps the most amazing miracle on Earth. They make their own food. How? Deep inside these organisms, air and water turn into sugar. Without this miracle, none of us could eat or even take a breath. Let’s take a closer look at this amazing event. It starts with carbon dioxide, a gas found in air. You know about carbon dioxide if you’ve ever had a drink of pop. The bubbles in pop are made of carbon dioxide gas. When the bubbles burst, carbon dioxide escapes into the air. Plants and algae combine carbon dioxide from the air with a gas called hydrogen. But hydrogen isn’t found in the air. Instead, it comes from water. You may have heard the scientific name for water, H2O. What does that name mean? Water is made of two different atoms. Those atoms are hydrogen (letter H) and oxygen (letter O). The 2 tells us that in every water molecule there are two atoms of hydrogen attached to one atom of oxygen. Plants and algae use the energy of sunlight to split the water molecule. Two gases, hydrogen gas and oxygen gas, come from the water molecule. The oxygen escapes as waste. But it isn’t waste to us! The oxygen we breathe is made by plants and their relatives. We can thank them for not only the food we eat but also the air we breathe. Plants and algae build sugar from carbon dioxide and hydrogen. Sugar is fantastic at storing energy. Have you ever burned a marshmallow? Marshmallows burn easily because they’re made of sugar. Plants and algae use sugar to grow, to build and repair cells, and to reproduce. In lichen, the alga makes sugar, and uses some of it. The fungus also uses the alga’s sugar. In return, the fungus provides the structure and the protection that helps keep the alga alive. Lichens have no roots. Because of this, lichens can grow in strange places. Rocks, cliffs, and tree trunks are some of their favorite spots all over the world. In the Arctic and the Antarctic, there are no trees. Lichens survive there by clinging to rocks. Lichens grow slowly. They can stand long periods with no water. Also, they can withstand very cold weather. They even keep growing when covered in snow! Lichens are able to take water right out of extremely cold air. Russian cosmonauts have found that some lichens can even survive exposure to outer space! Lichens are tough. Many lichens reproduce simply by falling apart. Suppose a lichen gets particularly dry and cold. It might crumble and blow away in the wind. But the lichen isn’t dead. Instead, it is dormant. When warmer or wetter conditions return, the lichen might start growing again. Where once there was one lichen, now there are many, scattered by the wind. As long as just a little bit of the fungus and a little bit of the alga survive, the lichen can return. Lichens are important. Caribou depend on lichens for food. Humans have made colorful dyes from lichens. We’ve also made powerful medicines from them. Scientists are now studying how lichens can warn us about pollution. But most of all, lichens are an amazing example of cooperation. By working together, two separate organisms survive in some of the most difficult places on (or off!) Earth. Modified versions of this text are available for grades K-1 (Flesch-Kincaid Reading Level = 1.8) and grades 2-3 (Flesch-Kincaid Reading Level = 3.2). See below for links to all three versions in text, book, and electronic book forms. You can put this book together a couple of different ways. You can print out the pages, cut them in half and then order the pages back to front. Fold the stack in half and then staple the spine of the book. Pairs of pages can then be stapled or glued along the right edge. You can also assemble the book as a foldable book. To assemble the book this way, print the four pages and align the document pages so that the following book page numbers are in the lower right-hand corner: front page, page 6, page 2, and page 4. (The cover page should be on top and page 4 on the bottom.) Set your copier to copy single pages into double pages and run the four document pages in the order specified. Cut along the dotted line in the center of the double-sided page, place the book pages in order, fold, and staple along the spine. A partnership with Content Clips has allowed us to provide electronic versions of our expository articles. Students can listen to the article as they read along on the screen. These versions require Adobe Flash to view. If you don’t have Flash, you can download it for free from the Adobe web site. You will also need to turn off your pop-up blocker to use Content Clips. In each book, the play button (in the top right-hand corner) will play an audio file of the text on that page, while the icon in thebottom right-hand corner will turn to the next page. Please note that the audio files take a moment to load on each page. Once the file has been loaded, a play button will appear in the top right-hand corner of the page. To minimize the delay on each page, you can open the file and read through the article first. Once each page’s audio has loaded, it remains loaded until you close the browser window. By preparing the article ahead of time, you can have students start at the beginning of the book and read without delays. We’ve also created a literacy set that includes all of the illustrated and electronic books in one convenient location! A lesson plan in which students observe and describe different types of lichens and identify the environmental conditions that foster lichen growth. From the Florida Schoolyard Wildlife Project Activity Guide. This article was written by Stephen Whitt. For more information, see the Contributors page. Email Stephen at beyondpenguins@msteacher.org. Copyright March 2009 – The Ohio State University. This material is based upon work supported by the National Science Foundation under Grant No. 0733024. Any opinions, findings, and conclusions or recommendations expressed in this material are those of the author(s) and do not necessarily reflect the views of the National Science Foundation. This work is licensed under an Attribution-ShareAlike 3.0 Unported Creative Commons license.